“We should pass a law against bombings! You cannot prevent evil people, bent upon evil, from doing evil. They will find a way to do it. What they want to do is illegal already, and the absurdity of passing a law against the crime only provides people with a false sense of security. It is understandable, in the wake of tragedies such as Boston or Newtown, that people want to do something to prevent evil from happening, but as good as the government is or can be in preventing such attacks, it cannot do it perfectly. 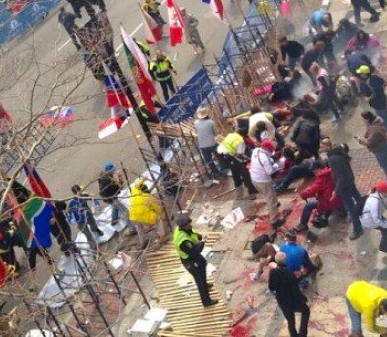 No amount of laws would have prevented the bombing in Boston. Those intent on breaking the law don’t care about laws. Fear, in response to these attacks, creates irrational behavior. In panic, people want some unseen power to protect them from all possible things that can go wrong, but their hope is illusory and unrealistic. Passing a ton of laws will not solve the problem of fear; it only provides a false sense of security, as if the Government were God and could magically protect them from all unknowns. There is a role for government in preventing attacks and defending the nation. That is the proper role of any government, and by and large, it seems that the government has done a decent job of providing a measure of safety at home during the last 12 years, but the real danger is that the people, moved by panic and fear, will surrender all their liberties for the illusion of safety. In the post-911 rush for security, laws were passed which directly contradict the US Constitution. Citizens are subject to warrantless searches. They can also be held indefinitely in prison without trial or without even being charged with a crime. In Nazi Germany, everyone had to have identity papers with them at all times. The government, in the name of security, wanted total control over the people. The danger is that our people will give absolute control over to the government in order to give them a false sense of security and protection from evil. That is why the gun control issue is also a red-herring. Criminals will get guns, just like they get drugs and enter the country illegally. If the government cannot prevent crime, drugs, or illegal entry into the US, how can it prevent criminals from getting guns or bomb makers from detonating them? The statistics show that 48 people were killed last year by semi-automatic “assault” rifles (not actually assault rifles, but that is another issue). Thousands were killed by knives and hammers. Should we pass national laws against knives and hammers? Yet in response to Newtown, some people, along with the media with an agenda, screamed for new laws which will do nothing to make people safer or more secure. At best, it may catch one or two crazed individuals if the background check is passed, but the guy in Colorado had no history, neither did the Newtown mother. They would have passed the check. So would the parents of the Columbine killers. Banning semi-automatic weapons will only remove them from the hands of law-abiding people. It will not remove them from the hands of the criminals who invade your home. If you want security, the average response time for the police to arrive at your home during a robbery or assault is 10-20 minutes. The best defense against lawlessness and terror is an armed citizenry. The citizen soldier who defends his home is the first line of defense, not the last. My point is that the government, while doing its job, can stop many acts of terror, it cannot make us safe, and it is foolish to think it can. Police respond after the crime has been committed, not before. The government, local, state or federal, for the most part, cannot prevent crime or stop it from taking place. They can only respond to crime once it has happened. I am glad the intelligence agencies are monitoring foreign phone calls and internet traffic, looking for clues to terrorist methods, plans, and propaganda, but I don’t hold an illusion that with all their best efforts, it makes us safe. It makes us safer, but not safe. The only person to trust with your life and the lives of your family and friends is God. If you hear and obey, you can be protected if He so wills. But to trust God also means he may ask you to give your life away for His Name’s sake. ← Beware Intuit QuickBooks tech “support” SCAM! To follow your logic would be to say we need no laws at all against criminal behavior, because criminals will just break them. But the fact is, when they break them, we have a reason to arrest them and lock them up. No laws, they roam free to do more damage. Ask a cop in DC, and he/she will tell you they LOVE gun control laws, because when they apprehend a suspect carrying an illegal weapon they at least have that reason to lock them up. It is absurd to say that laws against selling guns to known criminals or known nutcases are not helpful, and equally absurd to say they limit the rights of law-abiding citizens. Shame on the 45 Senators who did not have the guts to do what is right, and instead caved to the gun lobby. And shame on other citizens who confuse legitimate, responsible regulation with somehow limiting their second amendment rights to defend their families. Your families are far less safe today than they would have been if we had taken the minimal steps proposed by the bipartisan agreement. You shouldn’t allow paranoia to confuse your judgment. You misread what I said entirely. We already have laws against bombing and it is illegal, just as is murder. The Law itself will not prevent or protect the people from those bent upon doing evil. Now the reason the gun law failed is because instead of first proposing something reasonable like the Toomey-Mansion compromise at the beginning, you had a whole group of gun banning ideologues put forward a Feinstein-Schumber-Bloomberg-Soros universal registration and confiscation (if they had their stated wish), over the top, “don’t let a good crisis go to waste” attempt to destroy the Second Amendment entirely. It was a political use of a tragedy to push a very partisan agenda. It was a tactical error and it was the unrestrained left causing a backlash at a government overreach. I have no sympathy for the way this campaign of intimidation and zealotry was prosecuted or for its failure. But as I said, even if a universal check had been passed, it would not have prevented any of these tragedies, because they were all purchased by people without criminal records. Plus passing a national law in the heat of emotions is the blatant use of a tragedy for political purposes, forcing passage before it could be established rationally. So it was a miscalculation again on the part of those with an agenda. They are at fault for its failure, not the Senators who voted it down.